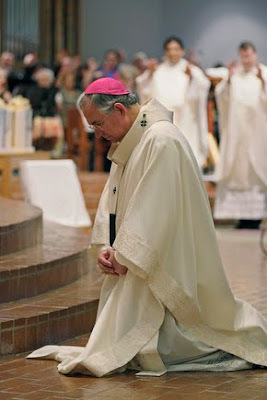 Ten days before his installation as Archbishop-in-Waiting of the continent's largest local church, José Gomez bade an emotional farewell to San Antonio yesterday before a packed-out, ticket-only crowd of 1,500. Gomez, 58, echoed what has been his consistent message for local Catholics: to rediscover their faith and let it drive them into a deeper spirituality, one with roots in San Antonio as a place where fervent missionaries toiled three centuries ago. Emotional throughout the sermon, he paused to control tears and stumbled through a request for prayers to help him inherit larger duties, including transitioning from an archdiocese with about 700,000 members to one with 4.3 million and an international platform. [T]he entire audience stretched hands toward Gomez at one point to pray for a blessing on him while he knelt at the steps of the altar. In a farewell presser bookending the afternoon Mass, Gomez underscored the question of his succession at the helm of the San Antone church, voicing his hope that the next archbishop would "be able to speak Spanish." In other words, while the better part of three decades with the nation's lone Hispanic archbishop have made San Antonio the Stateside church's de facto "Latin seat," that distinction's light-years ascent to the Pacific coast -- and, indeed, a national scenario in which demand for Hispanic prelates far outstrips supply -- signal that a third generation of the custom dating to Archbishop Patrick Flores' 1979 appointment is by no means assured. On a related note, Gomez's Roman standing as a result of the LA nod has already stepped up a notch. 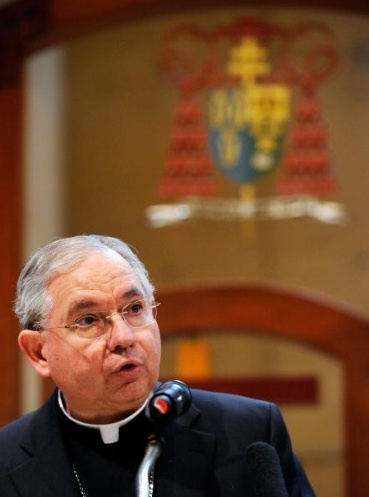 Earlier this month, Pope Benedict named the incoming coadjutor to the American council of the Synod of Bishops, placing him alongside such heavy-hitters as Cardinals Francis George of Chicago, the omnipresent Honduran Oscar Rodriguez Maradiaga, and the CDF prefect William Levada. 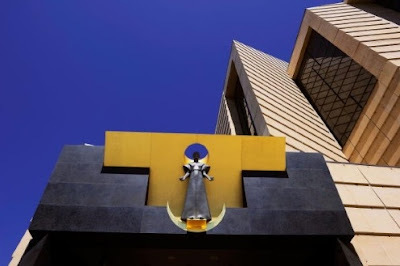 Since 2008, the archbishop has likewise served as a consultor to the Pontifical Commission for Latin America -- the Holy See's lead dicastery on matters South of the Border. For a live taste of B16's choice to inherit the Stateside bench's most challenging assignment, here's an interview Gomez gave shortly after his appointment was announced. The rite is rare: only twice before has an American cardinal ever welcomed the coadjutor who would succeed him... and only once since 1890 has it taken place on these shores. More as the day draws nearer, but as the SoCal crowd sees it, the 26 May liturgy marking the start of Gomez's nine-month crash-course on the mammoth Angeleno church is the town's "hottest ticket" in memory -- a tougher get than even Pope John Paul II's 1987 visit and the 2002 dedication of the 3,800-seat Cathedral of Our Lady of the Angels, where space is running so tight this time that only the archdiocese's 288 pastors have made the cut. With over 100 bishops and a flock of cardinals led by the native-son now in the Vatican's #3 post slated to be on hand, the afternoon rites (which will be webstreamed) promise to be a showcase of what's made LA Catholicism the national fold's lightning rod par excellence over the 25-year reign of Cardinal Roger Mahony: a style of church reflecting the wild diversity of the place, above all in vibrant, emotional worship drawn heavily from the traditions of its own. Along these lines, much of the plans will inevitably highlight the contrast of styles between the native-son cardinal and his Mexican-born successor -- the first Latin American cleric in position to receive a Stateside red hat, and the first non-Californian to take on the leadership of the Los Angeles church since then-Archbishop James McIntyre arrived from New York in 1948. ...and "The Lion King," it is. Combined with Alabaré and "Plenty Good Room," sure, but followed by a processional that'll make for a moving moment given one of the space's most-cherished features. The cardinal will preach the liturgy, which'll employ the texts of the Votive Mass for the Universal Church. Pieces in Latin, Tagalog and Vietnamese have been chosen to round out the rites, which are slated to close with the "God We Praise You" setting of the Te Deum. Four days later, the coadjutor will celebrate his first public Eucharist in his seat-to-be: the cathedral's 12.30pm Sunday Mass in Spanish. As previously hinted, your pages will be on-hand to cover it all on the ground. Thanks to Craig for the angelic portion of the journey... and as for the rest, gang, remember that your support doesn't just determine the expense budget, it is the expense budget.